Talking cat, Bob, funny app with option of live wallpaper. Talking Bob repeats everything you say in a funny way. Talking cat is very talented. Talking Bob plays beautiful music on the instruments and funny dances! Bob plays fantastic: trumpet, drums, guitar and lute. Bob also sings very well with his band! His funny friend Mouse makes jokes to him. Feed the cat if you want and look what will happen! Give him ice cream, milk, hamburger, corn and even more! At night (after 8 pm), Bob sleeps and snores. If you like talking cat, you can set him as a wallpaper. – Start speaking and Bob repeats everything you say in a funny way. – Tap the buttons to see how great Bob plays on the instruments. – Touch his belly, head and hands to see how funny things Bob does. Enjoy your time with Talking cat, Bob! In case of any problems with the effect of Talking cat, instead of giving us the negative opinion, please send us an e-mail and review briefly the problem. It will help us to solve it in the next updates of application with Talking Bob. 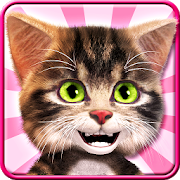 Talking cat Bob is free but contains ads inside application. Revenue from advertising will help us to create new attractive wallpapers and applications. All permissions are required only for advertising and are supported by trusted vendors.